Thanks for the kind words! I hope that you have an opportunity to visit that observatory and experience their equipment. Regarding dark matter: I’m no physicist but your description is about right. We can intuit the quantity of matter by observing its effects and yes, the matter we can see has the effects you describe. The effects, however, are far greater than the matter we can see would account for. The best explanation for this larger effect appears to be large quantities of additional matter of some other form. 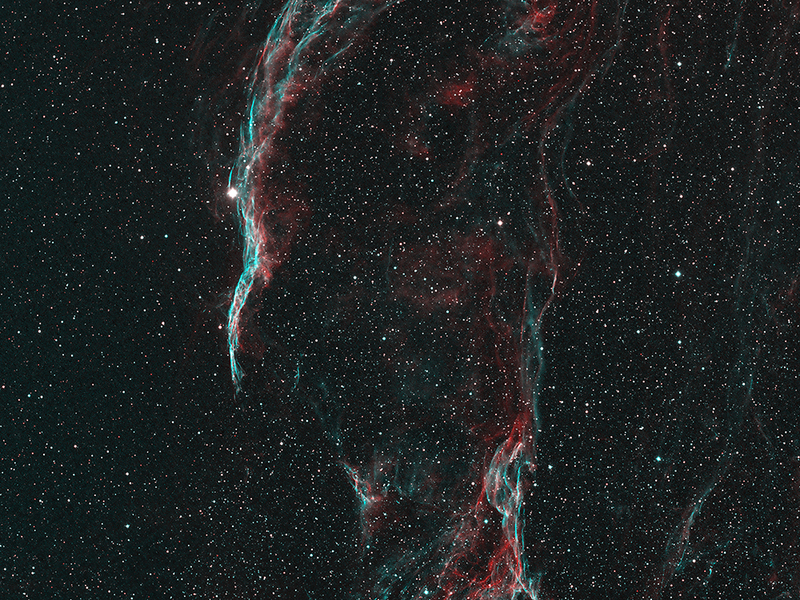 The image was captured through narrowband filters. One selected the H-a line, which is in the red portion of the spectrum. The other sekected the OIII line, which is just between the blue and green portions – call it teal. These were aszembled into an image by assigning the H-a data as red and the OIII data was used for both green and blue. This resulted in a natural color image. You can tell because the things that are red show as red, the things that are teal show as teal, and the white stars appear white. If you look at this object through a telescope you won’t se a color image, but that’s because our eyes can’t see color well when dark adapted. If our vision displayed colors properly in dim light this is what you would see. And nice work with your Meade,by the way i have seen the price..